Heat oil and butter in a large pot. Add onion, parsley, and garlic and cook until onion is transparent. Add sherry and cook an additional five minutes. Add tomatoes and tomato sauce, bay leaves and seasonings. Stir frequently while cooking 15 to 20 minutes. Add clam juice, cover, and simmer for a half hour. Add all seafood except halibut to the sauce. Add water if necessary. Cook for five minutes, add halibut, and cook an additional ten minutes. 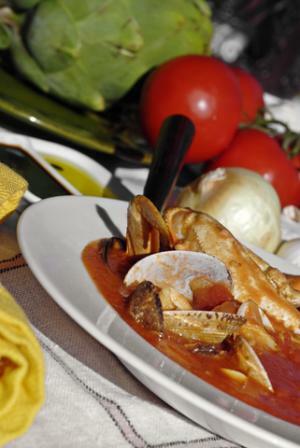 When clams have opened, cioppino is ready to serve.